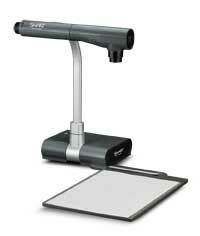 I am very interested at the moment in the use of the SMART Document camera in various curriculum areas. In the first of what hopefully will be a number of posts over the next term related to the use of the SMART Document camera (essentially a visualiser which integrates with ease with SMART Notebook on the SMART IWB range), I will start by looking at what a SMART Document Camera is and think about just some of the possible uses of one in a classroom situation. What is a SMART Document Camera? The SMART document camera is basically a visualiser – it will show anything that is put underneath it. Unlike an old style OHP, the document camera provides a digital image and therefore anything put under it can be seen, including 3D objects, it can also be used for demonstrations. How does it work and how simple is it to use? Very simple and integrates easily with SMART notebook, whilst I don’t have experience of other visualisers, I know that one of the benefits of the SMART document camera is its ‘plug and play’ ease! As long as the computer has SMART notebook installed the camera, which connects via a USB port can quickly and easily be set up, making it very user friendly in lessons and for sharing between classrooms / departments. The camera has a good zoom and an auto-focus function, giving a good quality image for using in teaching and learning opportunities. When used in conjunction with the many SMART notebook tools, such as the magic pen, highlighter, pen tools, camera tools etc.. it has great potential as an interactive teaching and learning tool. share student work – student work can be put under the camera and peer assessment undertaken (been successfully used during exam time) – good for promoting collaborative learning. share good work / used to show examples of good presentation / re-work draft answer / comment on student answers. manipulate and reposition sentences / paragraphs / objects from a variety of manuscripts / documents / students work using the SMART notebook camera tools. project resources – e.g. textbooks for whole class scrutiny.